The town of Fuquay-Varina, located in Wake County, North Carolina, is all about delivering more. For the charming community that’s home to a growing population of 27,000 residents, living in Fuquay-Varina means being part of a growing municipality where citizen engagement is high, volunteerism is strong, and opportunities are unfolding rapidly. The town has been experiencing a period of transformational growth over the past several years, leading to a population boom as residents looking for more out of their community are realizing that there is something uniquely special about a town with a big personality and limitless possibilities. The leadership at Fuquay-Varina is also committed to more, and to doing more to further stimulate civic engagement and give its citizens the unparalleled experience they want from their local government. With the launch of its new CivicEngage® website, the leadership at Fuquay-Varina realized that the next obvious progression of bringing more engagement tools to its citizens, meant enhancing their mobile experience. To achieve its goal, it implemented the CivicEngage® Mobile app. Not surprisingly, the resulting citizen adoption and use has proven that the residents of Fuquay-Varina continually want even more ways to engage in their community. While Fuquay-Varina enjoys the benefits of an engaged community, it faces challenges attempting to meet the expectations of citizens looking to constantly stay informed with the latest news, information, and alerts. In looking for solutions to give citizens immediate access to news and information, and demonstrate their modern, tech-savvy commitment to citizen engagement, Weis and the administrative team at Fuquay-Varina decided to implement the CivicEngage Mobile app as part of their communication strategy. “Implementing the CivicEngage Mobile app was part of our goal of making information more accessible to citizens,” said Weiss. To achieve its goal, the town started with a redesigned CivicEngage website. For Fuquay-Varina, an important part of the mobile app planning process was deciding what features and content the app would make available, a process it collaborated on with its CivicEngage project management team. According to Weis, the team looked at website traffic data to identify the content and services citizens were searching for most frequently to determine what content to include in the mobile app launch. The chosen features included Agenda Center, Calendar, Facilities, FAQs, Jobs, Parks, News Flash, and Recycling. In addition, the town incorporated some of its unique offerings into the app, as always, to give its citizens a dash more. “We included a link to a new mapping program we offer that allows people to go online and do their own mapping using our GIS information. We also have a big Balloon Fest here in Fuquay-Varina every Memorial Day, so we included a feature in our app that links directly to the balloon fest’s primary mobile website. The CivicEngage Mobile app pulls content directly from the CivicEngage content management system (CMS), which means Weis and all other system administrators only need to make content updates in one location, and the updates are reflected on both the website, and in the mobile app. When Fuquay-Varina launched its CivicEngage Mobile app, even though it expected a strong adoption rate from its engaged citizens, it still completed a robust marketing and promotional campaign to generate awareness and encourage downloads. Additional promotional tactics included monthly posts on social media, promotional messages on its CivicEngage website, and the use of a QR code to encourage immediate downloads. As a result of its efforts, over 600 citizens have downloaded the mobile app. According to Weis, the app is popular among the town’s staff as well. According to Weis, the process of building, launching, and promoting the mobile app was extremely positive thanks to its team at CivicPlus. 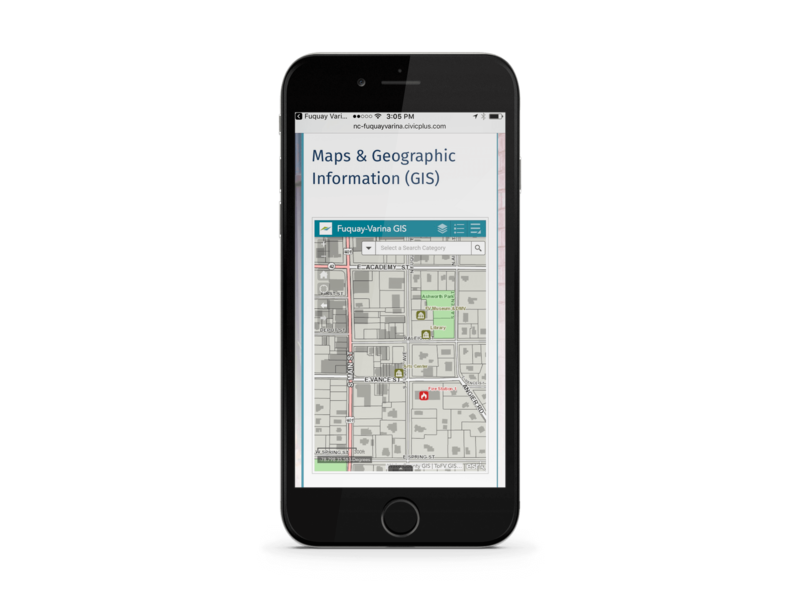 Most importantly, the app is one more way CivicPlus’ solutions help the town of Fuquay-Varina accomplish its communication goals. Ready to give your citizens more with the CivicEngage Mobile app? Click below to get started.